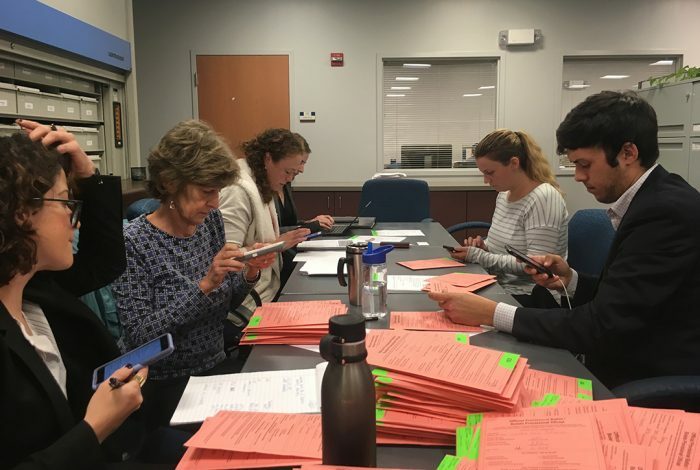 From left to right, a lawyer representing the Democratic Party of Georgia, a member of the Democratic Party of Georgia voter protection team, Bourdeaux campaign staff, and a representative of the Kemp campaign reviewing provisional ballots at the Gwinnett County Board of Elections office, November 8, 2018. None wished to identify themselves to WhoWhatWhy. Later, lawyers for Woodall's campaign and a public relations manager from the RNC would arrive, all also refraining from identifying themselves. Photo credit: Jordan Wilkie / WhoWhatWhy. Desiree Paula Martindale was visiting her children in New Jersey and knew she wouldn’t be back in Georgia until December, so in mid-October she decided to send an absentee ballot in the mail. If Martindale’s vote, and others like it, are counted by the Gwinnett County Board of Elections and Registrations, it could bring a congressional race to a near-tie. This afternoon, under guidance from the secretary of state’s office and a court order, the five officials on Gwinnett’s elections board will decide the outcome of Georgia’s last remaining congressional race. The discretion exercised by the county’s Board of Elections and Registrations will either give the Democrat a chance to catch up or will seal the victory for the Republican. At question is the fate of two sets of ballots — provisional and rejected absentee mail-in. 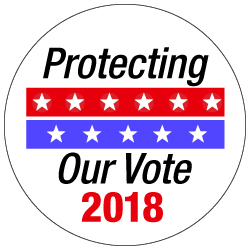 Provisional ballots are cast by voters who, for any number of reasons, have the legitimacy of their ballot questioned — including voting at the wrong polling place on Election Day or, due to a mismatch between the address on their driver’s license and their voter registration. Mail-in ballots are cast by voters ahead of Election Day. Voters have to include certain information on the envelopes for these ballots, such as year of birth, address, and signature. Missing that, or if the envelope’s information does not match voter registration information, the ballot may not be counted. WhoWhatWhy’s exclusive reporting revealed that a high rate of mail-in absentee ballots was rejected in Georgia, with Gwinnett County having the highest rates of rejection of any county in the state. A series of lawsuits ensued, asking federal courts to judge the legitimacy of the ballot review process and arguing that many of those rejected ballots should be counted. At least 825 of the ballots rejected by Gwinnett county could include votes in the contested congressional race, where Democrat Carolyn Bourdeaux is trying to unseat Republican incumbent Rob Woodall. Bourdeaux is trailing Woodall by 901 votes. Adding provisional ballots to the number of rejected mail-in ballots shows that there are over 2,000 ballots that could be in play. Bourdeaux’s campaign believes that counting all of the provisional and absentee ballots will bring the race to a near-tie, and certainly well within the 1 percent margin that would allow a recount to be requested. WhoWhatWhy’s analysis shows that votes from both categories of ballots would have to break heavily Democratic, but given that Democratic voters are disproportionately forced to cast provisional votes or have their mail ballots rejected, the final tally could be as slim as a dozen votes. The race could even tilt in the Democrat’s favor, though that remains unlikely. On Monday night, the secretary of state issued a guidance to all county election officials stating that they could accept ballots with errors such as putting the current year on the envelope instead of the year of birth. State Board of Elections member David Worley responded to the indecisive guidance in an email, saying that Secretary of State Robyn Crittenden omitted a crucial piece of information. According to Worley, the secretary of state’s guidance says counties could count many of the rejected ballots, whereas federal law says that those ballots must be counted. Then, this morning, District Court Judge Leigh May ordered that Gwinnett must count absentee ballots with omitted or incorrect birth years. That narrows the discretion of Gwinnett’s board of electors, forcing them to count at least 276 of the previously rejected ballots. But they still hold the power over the remaining rejected ballots, including 356 rejected for “insufficient oath information,” a catch-all category that could indicate a problem with a signature, year of birth, or address. Marilyn Marks, executive director of the nonprofit election watchdog Coalition for Good Governance, has asked the county to review these ballots on behalf of the state’s Libertarian party, stating that some of them may be protected under Judge May’s order. WhoWhatWhy repeatedly asked for a definition of “insufficient oath information” and has not received it, with county lawyers saying only that they follow state law. There is no definition of “insufficient oath information” in state statute. The county’s Board of Registrations and Elections will meet at 2:00 PM and begin deliberations on which provisional ballots to accept and whether or not to accept previously rejected mail-in ballots. Notice of the public meeting was not posted on the county’s website until early this morning, despite Georgia’s public meetings law requiring that notices of regular meetings must be posted at least 24 hours in advance. In order to tie Woodall, Bourdeaux needs to gain a net of 901 votes, meaning she’ll have to win a very high proportion of the provisional and rejected absentee mail-in ballots. There are just short of 1,400 provisional ballots for the contested congressional district 7, an area that overlaps sections of Forsyth and Gwinnett counties. Forsyth certified its votes on Friday night, so all the attention is now on Gwinnett’s decisions. There are at least 825 rejected ballots being contested by the Bourdeaux campaign (and the Coalition for Good Governance and the ACLU from weeks-old lawsuits). As of Judge May’s ruling this morning, 276 of those must be counted. Election results show that, so far, 61 percent of absentee mail-in votes were cast for Bourdeaux. Keeping that rate, she’ll make up around 58 votes when the 276 ballots without the voter’s birth year are counted. If the rest are counted, that would help her make up another 166 votes. Almost all of those ballots were rejected for reasons that are not needed to verify a voter’s identity, and therefore are eligible to be counted, according to the secretary of state’s guidance. That would bring Bourdeaux’s deficit down to 726 ballots. The rules for provisional ballots are different. There are roughly 1,400 provisional ballots that could be applied to congressional district 7, according to public record (finding this number is an inexact science). The county says that 90 percent of provisional ballots are typically counted. That leaves the race with 1,260 ballots that will go either to Bourdeaux or Woodall. In order to catch up to Woodall’s vote count, Bourdeaux would have to win close to 79 percent of those provisional ballots, on the outer edge of the expected advantage for the Democrat. However, if the Gwinnett County Board of Registrations and Elections decides not to count all of the remaining rejected ballots, or decides not to count as many provisional ballots as expected, it could put the race out of reach for Bourdeaux. At that point, the only option remaining would be to challenge the election, which neither party has said it will do. No matter what happens, voters may end up disillusioned with the process, and the outcome. Martindale said just talking about the experience of having her ballot rejected made her upset. “Taxpayers are tired of this inefficiency and what appears to be fraud,” she told WhoWhatWhy. Related front page panorama photo credit: Adapted by WhoWhatWhy from seal (State of Georgia / Wikimedia).